That title sure caught you attention? Good. Now for the 1000-words-in-a-picture evidence. 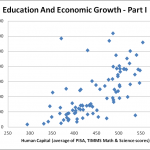 Human capital refers to educational attainment, as measured by the results of the PISA and TIMMS standardized tests*. As you can see, there is a very close correlation between human capital and GDP (PPP) per capita. The exceptions all confirm the rule. For now I have only done the post-socialist space, because of its sheer variety – different cultures, different rule-of-law and ease of business environments, difference resource endowments and political systems – which lets me illustrate just how irrelevant all those factors are compared to human capital. The same laws hold at the global level, and I intend to cover it in a consequent post, but that involves a lot more work so for now I’ll just settle for this. The Near Developed nations have respectable GDP per capita (approaching the poorer members of the classical developed world, such as Portugal and Greece), and levels of human capital that are basically equivalent to those of the rich countries. They are close to converging with the developed world, so growth tends to be relatively slow by the standards of more dynamic (but much poorer) emerging markets, on the order of 3%-5%. Despite their low positions, neither Russia nor Latvia are outliers; more recent calculations by the World Bank give Russia a PPP GDP of $20,000 for 2010, wedging it in with Hungary, Poland, and Lithuania; while Latvia was very severely affected by the late recession. The Czech Republic is close to being a positive outlier: One reason may be its proximity to developed Germany, another the early start of its reforms. The Red Train is, basically, China. Its searing growth rates aren’t because of its state capitalist system or the Confucian work ethic, but because its human capital is wildly out of line with its economic development. Its high school graduates are ready to operate complex machines and staff the most hi-tech enterprises, but the legacy of Maoist economics – which, hard as it is to believe, were even more inefficient and offered fewer incentives than under Soviet central planning – means that a significant share of the population still uses oxen-pulled plowshares for farming. So it is no wonder that, with its markets freed, the system is straining to catch up – at the pace of 10% per year – to its equilibrium place along with South Korea and Japan. Note also that according to some estimates, China’s PPP GDP is now larger than America’s, which would give a per capita level of $10,000 or so; significantly higher than the figure displayed on the graph. 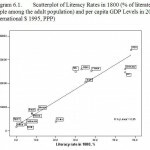 The Slow Middle are countries with moderate levels of human capital, and they are significantly poorer than the Near Developed nations; for them, convergence to developed country levels is still far away. Their growth rates are modest because their economic development is only slightly, if at all, below the level natural for their degree of human capital. While Turkey and the Balkan countries don’t look that far away from the poorest Near Developed countries, it should be noted that all three are currently suffering from major disbalances that could well end up in Latvian-style crashes. To set themselves on a sustainable development path, they will have to raise their human capital levels by at least another notch. The two negative outliers are Ukraine and Armenia. Ukraine has just been horrendously mismanaged; as I argued in a prior post, it never left the period of “anarchic stasis” that characterized Russia in the 1990’s. That said, the Ukraine may not so much of an outlier; its prices are low, and salaries are comparable to Serbia’s, so its PPP GDP may well be substantially underestimated. Armenia is an even more glaring outlier, with human capital that is comparable to the weaker Near Developed members, but I suppose huge military spending and being blockaded on two sides, and bordering Georgia and Iran on the other two, isn’t conductive to prosperity. 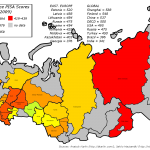 The Doldrums consist of Georgia and Moldova. Georgia has had good management under Saakashvili (it is now far less corrupt than Russia, or its Caucasian neighbors, and Ease of Business is very good by global standards), and Moldova has had bad management; nonetheless, their differences in GDP per capita are modest. The problem is that their schools produce people who are, largely speaking, functionally innumerate; so no matter how hard Saakashvili wills it, Georgia isn’t becoming a Singapore of the Black Sea any time soon. Sustained convergence to developed country levels is out of sight; radical improvements in human capital will first have to be made, and they can’t happen in the space of a few years; they require decades. The Saved By Oil group include Kazakhstan and Azerbaijan. They are as wealthy as the Slow Middle, but as stupid as the Doldrums. But in a world of high oil prices they should be relatively well off. Kyrgyzstan is in the Third World. Although its Soviet-era legacy has enabled it to provide universal primary schooling, the quality of the products of that schooling is comparable to India – at the very bottom of the global heap. It may achieve decent growth of perhaps 4% or 5%, but it will be from a very low base. There are several conclusions to this. First, there are only really three important factors to economic development. First, above all, human capital, i.e. primarily, the quality of education. It makes sense on an intuitive level and there’s a ton of literature in support but the graph above makes it… graphically clear. Second, resource endowments, when highly concentrated per unit of non-resource extraction based GDP – as in Kazakhstan and Azerbaijan, but not quite in Russia – will hugely, and positively, influence the level of GDP (it does play a substantial positive role in Russia but it should be noted that Russia’s oil production per capita is less than Canada’s, and its oil production per unit of GDP is far less than Kazakhstan’s or Azerbaijan’s). Third, political management. Especially incompetent regimes such as the ones in Ukraine will hold it back from achieving the full potential enabled by its human capital; if its monstrously incompetent and repressive of growth, as in Maoist China, the resulting gap between reality and potential can develop to truly vast proportions; consequently, when the most egregious barriers are removed, as during the late 1970’s, growth takes off at truly prodigal rates. Equally important is the fact that things commonly cited by Thomas Friedman, Davos Man, The Economist, The WSJ, The Financial Times, the respectable experts, etc. etc. as important for economic growth turn out to be largely irrelevant. Ukraine is more democratic than Russia and Kyrgyzstan is more democratic than China, but their growth profiles are much worse regardless. Russia is fairly corrupt – though not nearly to the extent implied by Transparency International’s Corruption Perceptions Index – and so is Hungary, and they both have much poorer Ease of Business indicators, but they are both much better off than cleaner and business-friendly Georgia. Latvia was part of the “clean” Baltics, but that didn’t stop it from tumbling to the bottom of the Near Developed pack in the wake of the global financial crash; is it too much of a coincidence that Estonia, which has a slightly edge in human capital, managed to hang in tight? The three biggest outliers by far in a best fit line on the graph – China, Kazakhstan, and Azerbaijan – are all patently explainable by a Maoist legacy and oil windfalls. Suffice to say, most of the former socialist bloc – most of the world, in fact, but that’s for another post – is at precisely the economic development levels implied by their levels of human capital. There are exceptions, most especially China, but to a lesser extent also many of the poorer Near Developed countries, where the distortive legacy of central planning has resulted in lower current economic development levels than should otherwise have been the case had markets been allowed to function; nonetheless, they tend to compensate with respectable growth rates, as the reality – potential gap seeks closure. If you need to blame someone for why your country is poor, don’t bother trotting out the usual canards: State interference, authoritarianism, corruption, anti-Western policies, privatization and liberalization will solve everything! (liberal canards); neocolonialist exploitation (leftist canards); Russian exploitation (East European nationalist canards). More likely than not your countrymen are illiterate, innumerate slobbering buffoons and it’s as simple as that. * Human capital was calculated by the average of PISA 2000 scores in Math and Science, and of TIMMS 2008 scores in Math and Science. 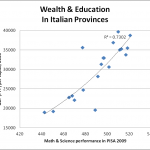 Where data sets for both assessments existed for a particular country, the TIMMS score was – on average – around 7.7% higher than the PISA score, so I adjusted the former down by that amount. 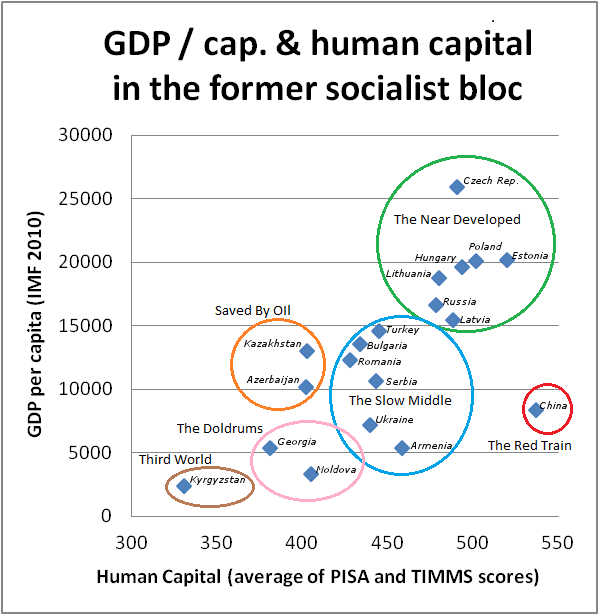 The human capital index was calculated by taking the average of the PISA and adjusted TIMMS scores where applicable, or either the PISA score or the adjusted TIMMS score where data for only one of them existed.